What do these all have in common? They filled our Saturday. I bought pumpkins for our front porch about 2 weeks ago. I bought them while Ella and Miller were at school and had them in the car when I picked them up. They were so excited that we finally had some decorations (this is one area where I am just not good at, but I am starting to get the sense that I am going to have to put in more effort because Miller asks me almost every day for more decorations) and so excited to put them on our front porch. Since we have put the pumpkins out, I think they have asked every day if we could carve our big pumpkin. We have had several conversations about pumpkins rotting if they are carved too soon, but for some reason it has not sunk in. Needless to say, they were thrilled when we told them this morning that today was the day that we were carving the pumpkin. Ella and Miller were in agreement that they wanted a happy pumpkin. Here Ella is drawing just what she wants the face to look like (and it looks like Miller is about to stab his eye out, don't worry he did not). I tried to take over from that point and draw the face on the pumpkin, but Ella would have none of that. She wanted to also draw the face on the pumpkin. When she was not paying attention I drew the real lines that Murray was to follow. It is really when we are doing "holiday traditions" (carving pumpkins, dying easter eggs, putting ornaments on the tree) that I see how much of a control freak that I really am. It takes all I have to hold back and let my kids do what they want to do instead of the way that I think is best. That is why I was on picture duty! After I told Ella we had to get all of the guts out of the pumpkin so that it would not catch on fire, she made sure Murray got every string and seed out of the pumpkin. A sweet friend from church gave Ella her tickets to see the Alabama Ballet's production of Snow White. Ella and Lucy had a blast! They had a hard time understanding why Snow White was not talking and every time Snow White left the stage Ella kept asking where Snow White went, but they loved it. I love this picture because when I told them I wanted to take their picture Ella leaned over and posed pulling her shoulder back to get her best angle. Is she 4 or 14? She thinks she is 14! My dad is here this weekend and we have concluded that he is who Sara Wells looks like. It is hard to tell, but she definitely has his eyes! I realize that I showed you all the fabric that I had big plans for and then never reported my progress. Part of the reason is I do not have many "completed" outfits. I knew I needed to get Miller's pants made when I had a big chunk of time (while Murray was gone). But since it was still 80 degrees outside, I had no motivation to make the t-shirts to go with them. Looking at the 10 day forecast earlier this week, I realized Miller might finally need some long sleeve shirts. So I have started focusing more of my sewing efforts back on him. These dinosaur pants are his favorite pants! He asks to wear them everyday and I have had to keep telling him no because it has been too hot for pants. I knew he would be able to wear them today so I finally made the dinosaur shirt to go with them. He is almost more fun to sew for than Ella because when I make him something cool like dinosaur pants and t-shirt, he LOVES them! Here is Miller trying not to be happy. You teach your kids that it is way more fun playing in a trailer than on the swing set or riding bikes. 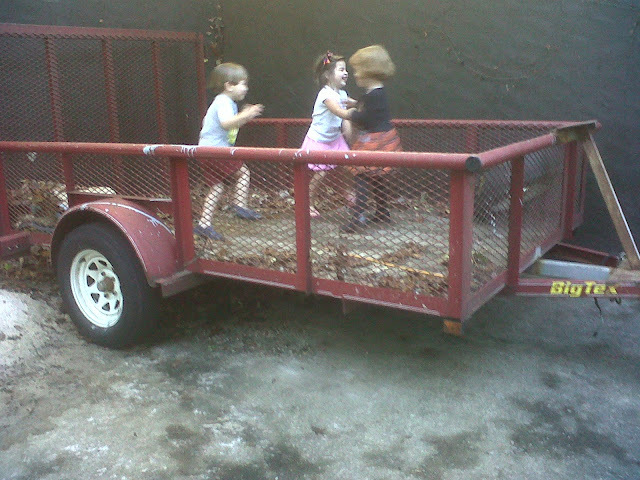 Who knew a trailer could be so much fun? I think because of our long summer inside due to the hot, hot, hot summer we have been spending lots and lots of time outside. Much of that time has been spent with me holding Sara Wells because we did not really have anything for her to play with/in yet. 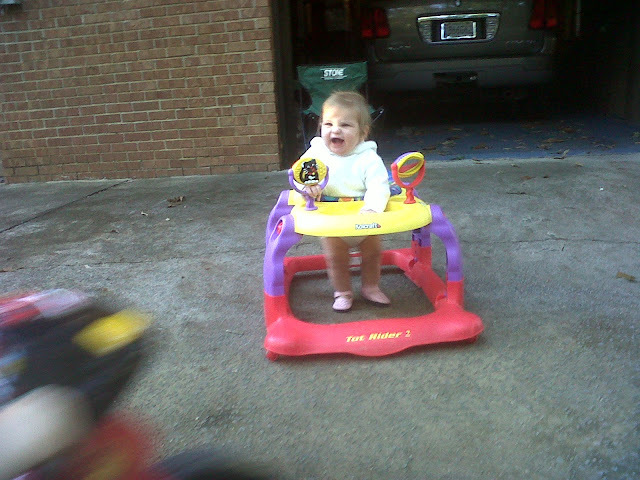 Thank you to our next door neighbors, Sara Wells now has her own walker for playing in the driveway. And she loves it!!! She was so proud of herself walking all over the driveway! Sara Wells enjoyed her first popsicle today. 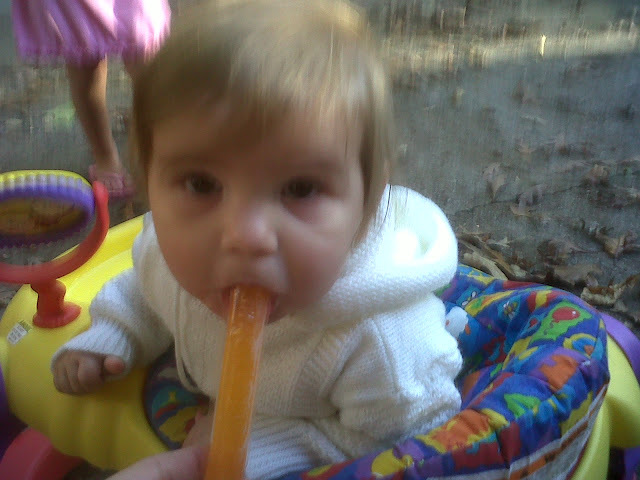 I am pretty sure that neither Ella or Miller had a popsicle at 9 months. Oh to be the baby! I think Sara Wells ate her popsicle faster than Miller. We all know that Miller is slightly obsessed with Buzz Lightyear and pretty much anything Toy Story. Of course he is going to be Buzz for Halloween. On Mondays it is just Miller and me and I like to try to do something fun when it is just us. I remembered one of my friends got her little boy Buzz wings several years ago at Party City and thought how much Miller would love to have his own wings. I did not know how good my chances were that they would still carry the blow up wings, but it was worth a try. Obviously, they still carry the wings! Miller now does not go many places without his wings. Murray's birthday was actually Sunday. I am so late in posting because we have gone to bed at 9:00 the last two nights. Yes, 9:00. Glorious!!!! But, since the Lee Family tradition is to celebrates the whole birthday month, I am not really late. With his birthday falling on Sunday, Murray got to have an entire birthday weekend. For his birthday weekend, we went to the lake. The kids were very excited to go to the lake to celebrate Daddy's Birthday! It is official the Lee Children love babies! We made it home Saturday night just in time to have baths and watch to Alabama game (thank goodness for DVR). This is what it looks like at the Lee House when Alabama plays anywhere close to dinner time. What a birthday weekend! Happy Birthday to the best Husband and Daddy EVER!!!! We love you! This same bed looked like this last week when Murray and the kids planted the garden. Three days later, it was down to this. It turns out that the deer really like broccoli, cauliflower, and cabbage. They did leave some greens. And don't worry, all of the brussel sprouts! We are hoping to get a few nets to put over the beds to prevent any future feasts the deer might want to have. Sara Wells' new love, markers! Miller has over night developed a love for coloring, I mean LOVE! So, there are now always markers out on the table. 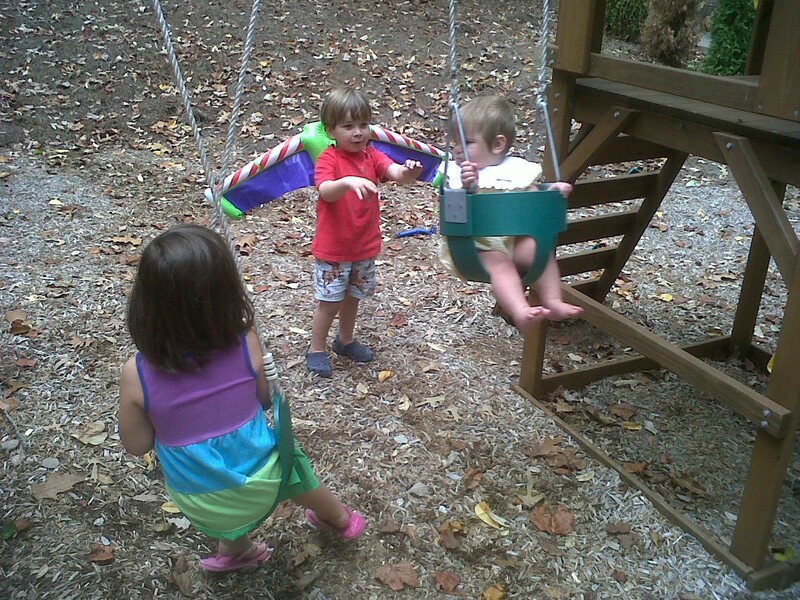 They are Sara Wells favorite toys. Miller can color for hours and Sara Wells can play with markers for hours (well maybe only minutes, but minutes of happy occupation seem like hours). So far she has not figured out how to take the tops off. That will be a sad day for everyone because there will be no more markers to play with. For now, we will enjoy the fun! Miller came home from school two weeks ago and just started coloring. Not his usual pick up a marker, scribble all over the page for 5 seconds, throw the marker down and walk away. He colored for probably 30 min, as "in the lines" as a 2 1/2 year old boy can do. It is all he wants to do now. He has even passed up wrestling with Murray (his very favorite thing to do) to color. We may have another artist in the family.